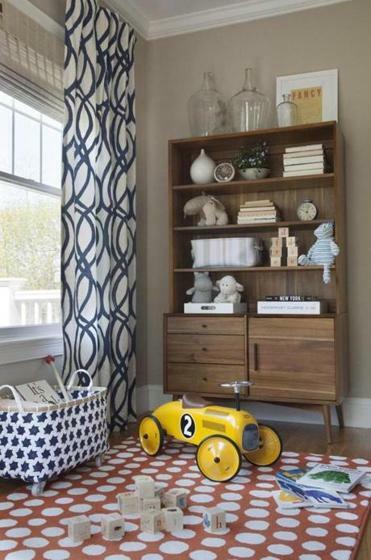 A brand-new house, this Needham residence was spacious and bright with plenty of room for the Beacon Hill transplants and their young son to spread out. Yet the airy rooms were blank canvases that needed to be tailored to reflect the family’s style. In came interior designer Tracy Parkinson to infuse the rooms with color, subtle sophistication, and an overall laid-back, personal appeal. Parkinson focused on the family room and living room, which are adjacent to each other, and where the family spends most of their time. “The owners didn’t want to have two back-to-back rooms with the same type of furniture. So rather than put another sofa and two chairs in the living room, we turned it into a library,” says Parkinson, whose firm, Nest + Company, is based in Norwood. Walls in both spaces are a neutral gray that has a hint of taupe, which works as a good backdrop for the various colors — orange, green, and blue — found in the family room furnishings. “You don’t want rooms to look like a display in a retail catalog,” says Parkinson, who interspersed custom elements like the woven roman shades in both rooms with off-the-shelf items to create a balanced, vivid environment where the family feels very much at home. 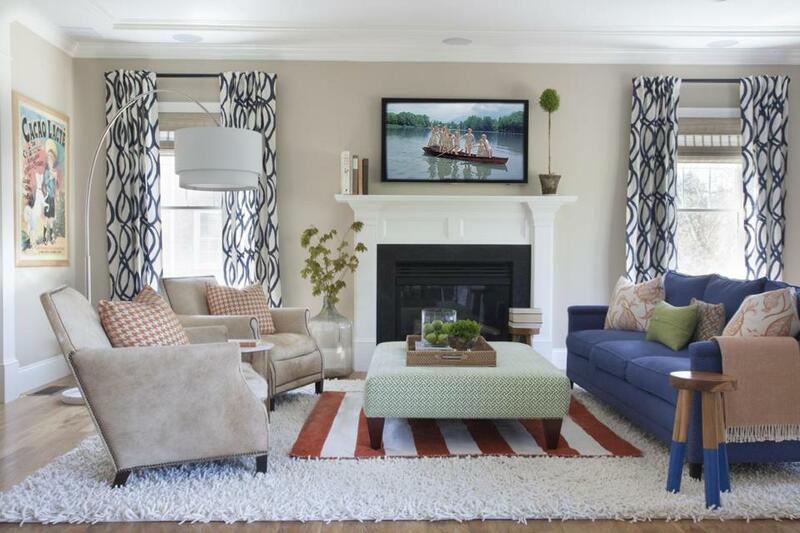 A deep blue Serena & Lily sofa is accented with orange and green throw pillows. Cowhide leather armchairs are also from Serena & Lily. The oversize ottoman, upholstered in green and white Sunbrella fabric, serves as a coffee table. A shag rug was custom made for the room. A children’s play area is behind the couch. Rolling carts ensure that toys can be cleaned up in a snap. A West Elm desk was selected for its hallmarks of mid-century design. Parkinson found a orange and white polka dot rug for less that $15 from Ikea. “It’s cute and fun, but if juice gets spilled on it you can throw it away,” says Parkinson. 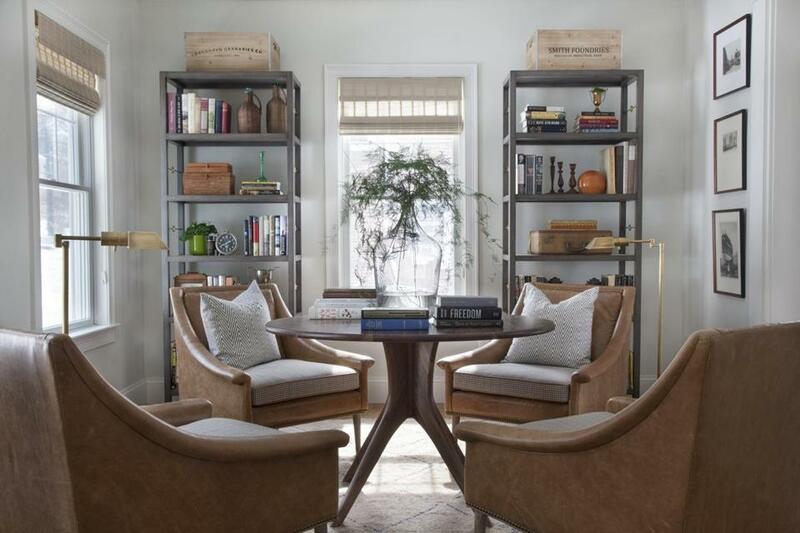 While libraries tend to evoke a dark wood room with built-in shelves, Interior designer Tracy Parkinson strove to keep this one light and bright. Free-standing bookcases, from Serena & Lily, have shelves sheathed with grass cloth and brass detailing on the ends. The walnut pedestal table is by Room & Board; the leather chairs, which have cushions upholstered in a houndstooth pattern, were found at Anthropologie. “They are deep enough that you can sit back and read a book and straight and tight enough that you can eat and be comfortable,” says Parkinson.